The 1st year students of National Institute of Technology (NIT) here continuing with indefinite Strike demanding immediate basic facility at the campus which reached to second day today. Around 147 student are sitting in front of main gate of the Institution since yesterday demanding basic facility like 24 hours running water, clean and hygiene toilet, proper bus facility, establishment of regular OPD with medicines, separate hostel building, shopping complex, amusement place, mobile network with internet, proper academic atmosphere which all is lacking behind. 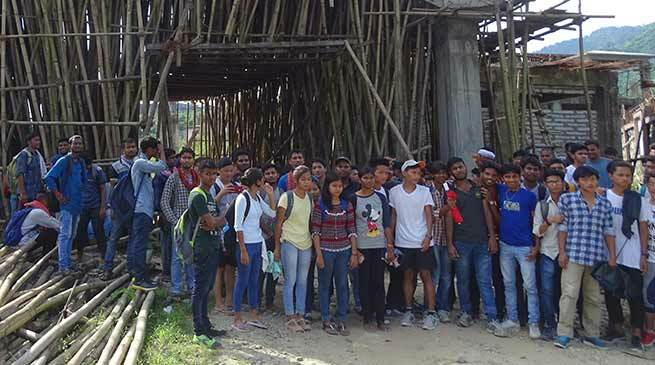 The authority without carrying out basic facility have shifted the 1st year students from Nirjuli (rented premise) to permanent campus here at which is still to be completed. The student allege that ten students each have been made to accommodate in compact room of Chemistry academic building whereas there is no hostel building is of now and the permanent hostel building is yet to be completed. One of the students said that we were promised for mobile network facility within a day but it was only for an hour on the date of shifting on October 5 and disappeared. One of the student while said that the network since yesterday is ok but the internet is limited to building premises and is very poor while other said that transport system is also not good as promised by the authority, one of the students said that we were about to go to senior student at Nirjuli but the bus tyre is puncture and there is no spear tyre and is a matter of joke made to us. One female student said that there is lack of sense of security in the campus and we fear that the campus is lacking behind proper security for girls as there is only two security while 22 girls studets, the campus lack proper security at main gate and hardly we see private security in the campus, however there ½ section of private security of NIT was seen while ½ section of police security was also seen in the campus though the Out Post established earlier was damaged due to storm earlier and there is urgent need of a permanent Out Post. The students said that what ever the promise made by the authority was not fulfilled, we have made ultimatum of three days which was fully ignored and we have been fooled, no faculty are taking care of us nether there is Registrar who come to campus to hear us in proper way, our parents are being informed and warned of consequences to be faced if involved in such democratic movement, the lack of permanent Director is another problem of which many issue remain resolved. Asstiant Registrar Taba Tadhe Goyeng interacting to mediaperson said that shifting of NIT from temporary to permanent campus was necessary and directive from MHRD of which decision was taken at the highest body of the Board of Governor (BUG) of NIT. The shifting was planning in August 16 but due to pathetic road condition, heavy down pour and other issue the shifting was delayed. Tadhe said that we are for the wellbeing of the students and we never want that they face problem in their part of academic activities. The earlier accommodation was at Yupia/Nirjuli which were directed to shift by MHRD vacate while it was necessitated after received of vacation notice from Papum Pare district administration dated August 14 2017, said Tadhe. He said that we have given assurance in writing to the students for resolving the demands for construction of temporary bathroom near temporary hostel within 3 days, medical facilities will be provided at the earliest while Ambulance facility is available in campus with first aid facility, internet and mobile connectivity which have been resolved yesterday evening. NIT Jote have apprise the students problems to the higher authority and we may place before the Board of Governing meeting (BOG) supposed to be held this month, the main problem of infrastructure is not what everyone is speaking about but facilities/infrastructure is being created but delayed due to lack of fund provision and payment to the construction agency, some of the projected have not been completed inspite of passing of completion date which too have been informed in writing to the higher authority Tade added. Meanwhile student leader of AAPSU were seen today inspecting the NIT campus while few local leaders on behalf of the students community were seen discussion the matter. One Tadar Akap while said that today problem is only due to non completion of the infrastructure but it is better than in others accommodation as this is permanent campus and children should have patience and concentrate for the examination to be held this month.